Is there a difference between Westside Pho and Eastside Pho? I posed this question to Rich Guy as we were having lunch at Taste of Vietnam. Really, there are not a whole lot of Vietnamese restaurants on the Westside of Vancouver. Of course the cost of rent and doing business is one reason and another could be the demographics. Then, realistically there should be, at the very least, some tweaks in the menu to appeal to the locals. That basically will lead me into my usual rant about how restaurants tailor their menu to the common denominator. They are not really all that interested in pleasing a few bloggers, food snobs or haters in general. They are out to make money (to feed their own family) and will do whatever it takes to attract customers. So as we ate our meal, we tempered our expectations. 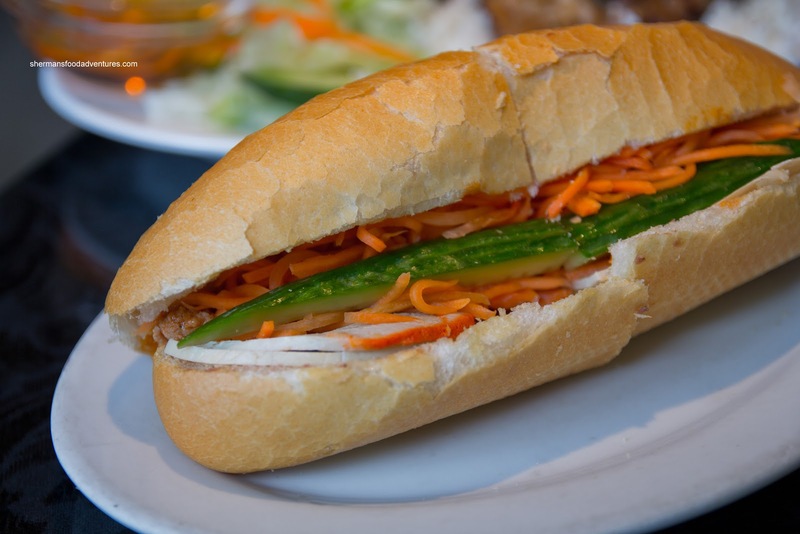 We started with the Banh Mi which was somewhat similar to the ones from Viet Sub in that there was some sweet sauce slathered throughout. Rich Guy wasn't fond of it and longed for a more Ba Le type version. I personally didn't mind it as there was enough butter-mayo and plenty of crunch from the carrots (were a bit bland though) and cucumber. Furthermore, the bread was toasted nicely being crunchy and airy. The amount of meat was chintzy though. 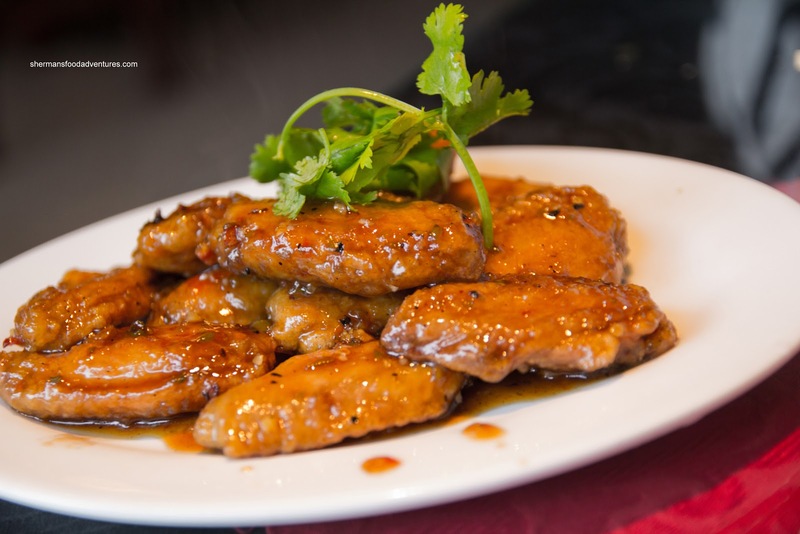 Arriving with considerable sauce, the Fried Chicken Wings were not what we were expecting. However, it turned out to be pretty tasty with a sauce that had all the flavours including salty, sweet, tart and spice. The wings themselves were moist and juicy, but the amount of sauce made the skin wet. For our mains, we shared the Lemongrass Chicken on Rice first. This looked pretty typical and did the job. The portion size was decent with 2 pieces of boneless chicken. It was charred properly, tender and flavourful. Nothing exciting, yet nothing bad either. 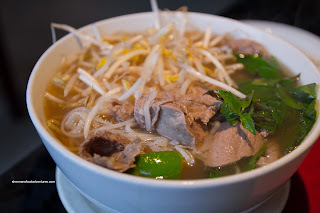 And of course we'd get a bowl of the Pho Dac Biet. Well, at least I did and Rich Guy had some. He was pretty full at this point... Pfft... Well, the broth was pretty light and didn't have much impact. We got a bit of sweetness, but not much else. There was a modest amount of rice noodles and meat. It was pretty average. 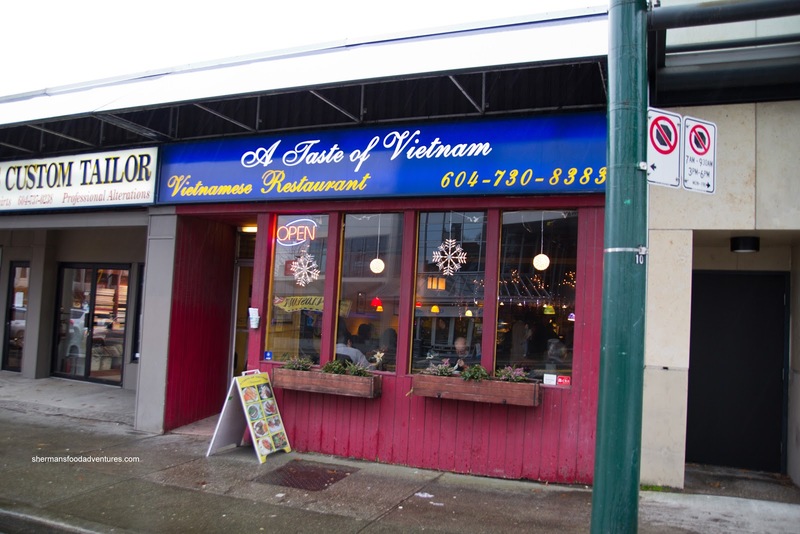 In the end, Taste of Vietnam did the job at a reasonable price (considering its location). 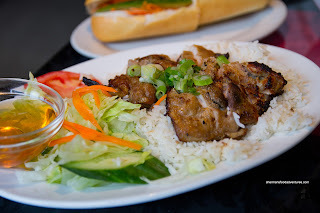 Obviously there is better Vietnamese to be found on the Eastside and in Surrey, but they are a serviceable option for the lunch crowd.